It’s been some time since I’ve found a school-related image for Reusable Art. Oddly enough, it’s hard to find one that wasn’t a badly done engraving. Fortunately, “the schoolroom” was printed well and scanned nicely. It was from an 1893 book by Kate Tannatt Woods. Woods did not identify an illustrator for her work but based on the variety of signatures visible on the drawings, she drew from a variety of artists. This drawing has a signature in the bottom-left-hand corner but I don’t recognize it and can’t quite make it out. (If anyone recognizes the illustrator’s mark, please let me know.) Ironically, because Woods did not attribute the works, they are in the public domain, regardless of the illustrator’s history. In this charming drawing, we have Toots and His Friends attending kindergarten. His mother had heard stories of how the German people had kindergartens where the children learned great wonderful things but often thought they were just having fun. Toots is the title character of this charming book but I’m not exactly sure which of the children is Toots. 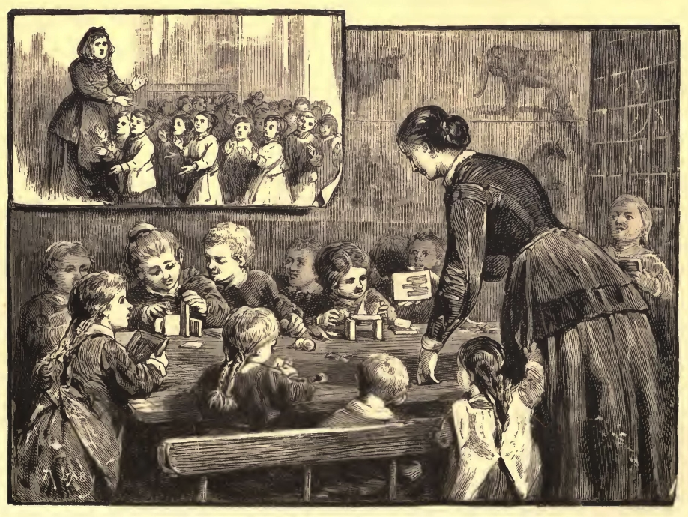 The children in the schoolroom appear to be doing a variety of activities from reading a book to playing with blocks and doing arts and crafts.